On the face of it, the connection between the internet of things (IoT) and animals is not an obvious one. However, a number of trials and larger-scale implementations of IoT use with household pets and on farms are showing that connecting Fido and Daisy to sensors could provide real benefits. This should not be surprising: animals are big business, both in terms of personal ownership and commercial farming. Mintel, a market research company, expects UK pet insurance premiums to grow from £976m in 2015 to £1.6bn by 2021. Anything that makes it easier and more efficient to care for and farm animals is therefore likely to be of interest. So how are animal farmers using the IoT? Cows are perhaps the most connected farm animals, since they are often the most valuable. For example, Irish company Moocall has a sensor that attaches to a cow’s tail and detects movement. Tail movements change when the cow is in labour (rather unsurprisingly), meaning that farmers can be alerted to an imminent birth, as well as to any problems or a birth that is lasting too long. In the UK alone, around 50,000 cows and 110,000 calves die each year because of problems during delivery. The app has huge potential to save animal lives and farmers’ livelihoods. Several sensors from different manufacturers can detect changes in how much a cow is walking, or monitor eating patterns. This information allows farmers to predict when cows are most fertile, so they can time breeding appropriately. They can also see which cows are eating more or producing less milk, and therefore which are most productive. Well Cow provides systems to monitor stomach acidity, and help to detect digestive problems. Sensors from Lely can monitor the quality of milk. Sheep are also getting in on the IoT act. A pilot last year in Norway tracked 1,000 sheep using narrowband IoT technology. This enabled farmers to check the location and well-being of sheep remotely. And how many ‘lost cat’ posters have you seen in your area in the last month? Small-scale local tracking devices would eliminate this problem by ensuring that owners could locate their animals. What all these applications have in common is money. 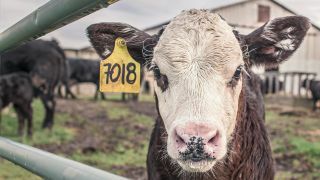 Preventing cows from an untimely death means that insurance companies will not have to pay out for the cost of the animal. Keeping sheep healthy saves on vet bills, and again, potentially, insurance. Even tracking pets has insurance implications, allowing companies to start taking a preventative approach to animal health. Many pet owners would likely use an app to track their pet’s health to indicate potential problems that could occur, much in the way we do with fitbits. With the Association of British Insurers announcing recently that pet claims in the UK surpassed one million in 2017, with £775m being paid out, there’s understandably a lot of interest in this topic from insurers too. Connecting animals is going to create a vast amount of data, but how do you get the intelligence out of that data? The key to unlocking value with all these applications is analytics, and particularly if deployed at the edge – in other words, taking analytics directly to the source data as it comes off sensors, so insights can be extracted immediately, rather than data being stored and then analysed later. Only with edge analytics can rapid, actionable insights be identified and used at the point at which it’s meaningful for the organisation.